A Fundamental Rights Petition against the Land Grabbing and destruction of livelihoods in Panama filed by a group of farmers and fishers representing the Organization for the Protection of Panam-Paththuwa was taken up for hearing by the Supreme Court on Thursday, March 28, 2013. The defendants not being present, the case was postponed to be taken up next on 10th July, 2013. A three member panel of judges comprising of Rumy Marshook, Sathya Hettige, and Eva Wanasundara presided. The complainants seek justice over a number of counts including physical attack, burning of their houses and belongings, forced eviction, land grabbing, destruction of livelihood, threat and intimidation etc., that continue unheeded and unaccounted for despite repeated protests, official complaints and legal action. The petitioners reported that the land they were evicted from is now being built illegally under heavy security. They disclosed that the Lahugala Pradeshiya Sabha objected the illegal construction of the land, and later filed case in the Pottuvil Magistrate Court. The hearing last, of 19th March 2013, the court had pronounced that the aforesaid constructions were illegal and therefore should seize until decision is made. 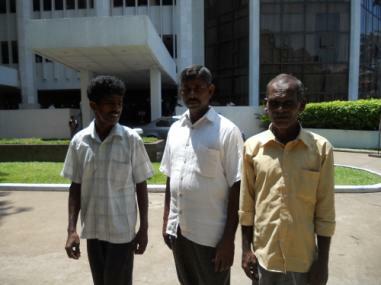 three of the petitioners (L-R: P. Somasiri, U. Aththanayake, P. Shankar Moorthy) who attended the proceedings representing the villagers leaving the court premises.